The patient was a 46-year-old male who was admitted to Harbor-UCLA Medical Center after presenting with a 2-month history of abdominal pain, nausea, vomiting and new-onset jaundice. An abdominal ultrasound was performed, revealing gallstones, a dilated common bile duct and a 2.4-cm hypoechoic left renal mass. Labs were significant for hyperbilirubinemia, transaminitis and elevated alkaline phosphatase. 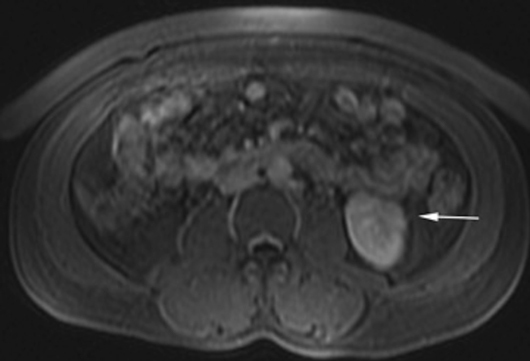 A CT of the abdomen and pelvis with contrast demonstrated a mildly enlarged pancreas with hypoenhancement of the pancreatic body and tail (Figure 1, click here to view DICOM images courtesy of Viztek), a dilated common bile duct and bilateral hypoattenuating renal masses (Figure 2). Tumor markers, including CEA, CA 19-9, CA-125 and chromogranin A, were within normal limits. An endoscopic retrograde cholangiopancreatogram (ERCP) was performed that demonstrated 2 distal CBD strictures and a biliary stent was placed. Intraductal biopsies obtained during the ERCP were negative for the presence of tumor cells. 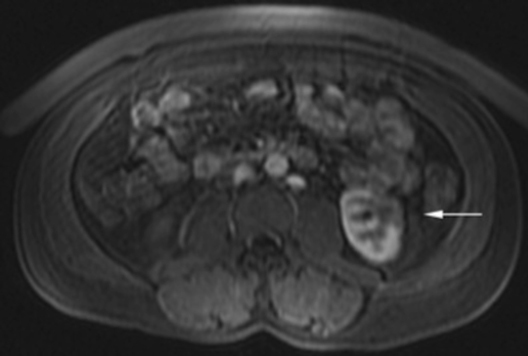 An abdominal MRI with contrast was performed that again showed CBD strictures (Figure 3), relative hypoenhancement of the pancreatic body and tail, and bilateral renal masses with relative hypoenhancement (Figures 4 and 5, click here to view DICOM images courtesy of Viztek). 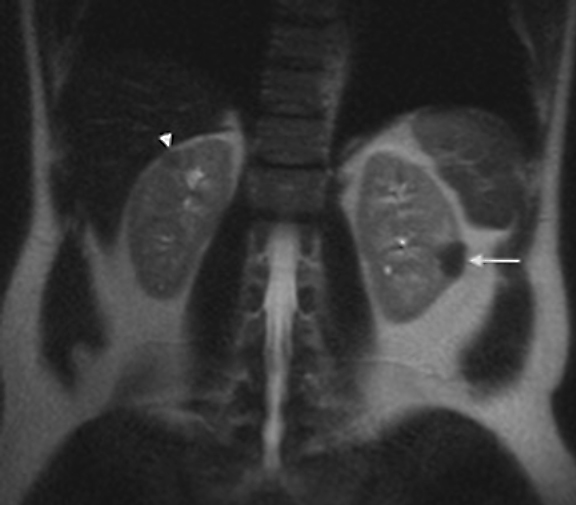 Eventually, the larger mass in the lower pole of the left kidney was biopsied under CT guidance. Histologic and cytologic analysis of the specimen demonstrated marked infiltration by IgG4 positive plasma cells and an increased number of lymphoid cells, including eosinophils, confirming the diagnosis of an AIP-associated renal mass. Autoimmune pancreatitis with associated renal lesions. Differential diagnoses: pancreatic malignancy, acute pancreatitis, renal cell carcinoma. Concerning renal involvement in AIP, four recent publications have reported a prevalence that ranges from 14-39%.2,6,11-12 Evaluation of several AIP associated renal lesions by Takahashi et al. and Triantopoulou et al. showed that the lesions displayed low attenuation on contrast-enhanced CT imaging, isointensity on T1-weighted MR imaging and hypointensity on T2-weighted MR imaging. Their studies also showed that on gadolinium-enhanced MR imaging, the lesions were isointense during the early phase and had a tendency to become less distinct during later phases.6-7 The masses present in our case were concordant with the typical published findings demonstrating T2 hypointensity and T1 isointensity. While the right renal masses were not well visualized on the contrast enhanced MRI, the mass within the lower pole of the left kidney demonstrated relative hypoenhancement in the early phases with gradual loss of distinct margins on later phases. 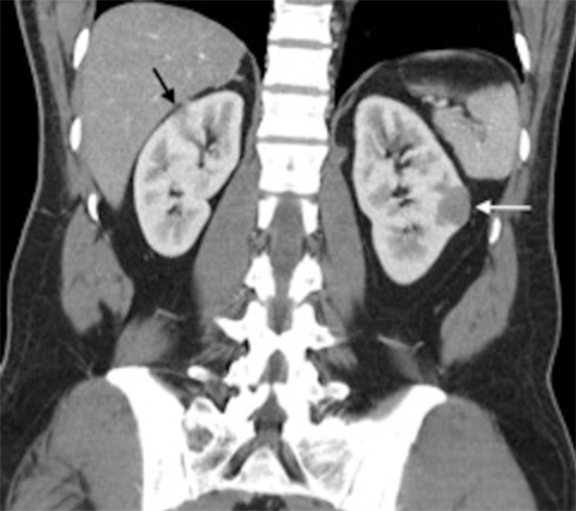 The mass within the mid left kidney demonstrated relative peripheral hypoenhancement with a central region of nonenhancement, which differs from the typically seen pattern. Autoimmune pancreatitis is a chronic inflammatory disorder of unknown etiology associated with hypergammaglobulinemia that leads to fibrosis and organ dysfunction. The disease process can mimic pancreatic adenocarcinoma both clinically and radiographically, which can lead to difficulty in obtaining a diagnosis. Imaging plays a critical role in the diagnosis of AIP by characterizing both pancreatic and extrapancreatic involvement. Extrapancreatic involvement in AIP is not uncommon and most commonly affects the biliary system, kidneys, lymph nodes and gallbladder. Renal lesions associated with AIP appear to be relatively common, with recent publications reporting a prevalence of 14-39%.2,11-12 In cases where pancreatic findings are indeterminate or non-specific for AIP, the presence of extrapancreatic lesions should increase suspicion of AIP as a diagnosis. Awareness of AIP, its associated pancreatic and extrapancreatic findings, and the use of recently published diagnostic algorithms can help reach a diagnosis while potentially avoiding unnecessary procedures. Okazaki K. Autoimmune pancreatitis: Etiology, pathogenesis, clinical findings and treatment. The Japanese experience. JOP.2005;6:89-96. Khalili K, Doyle DJ, Chawla TP et al. Renal cortical lesions in patients with autoimmune pancreatitis: a clue to differentiation from pancreatic malignancy. Eur J Radiol. 2008. 67(2):329-335. Vlachou PA, Khalili K, Jang HJ, et al. IgG4-related sclerosing disease: autoimmune pancreatitis and extrapancreatic manifestations. Radiographics. 2011;31(5):1379-1402. Takahasi N, Fletcher JG, Hough DM, et al. Autoimmune pancreatitis: Differentiation from pancreatic carcinoma and normal pancreas on the basis of enhancement characteristics at dual-phase CT. Am J Roentgenol. 2009;193(2):479-484. Irie H, Honda H, Baba S, et al. Autoimmune pancreatitis: CT and MR characteristics. Am J Roentgenol. 1998;170(5):1323-1327. Fujinaga Y, Kadoya M, Kawa S, et al. Characteristic findings in images of extra-pancreatic lesions associated with autoimmune pancreatitis. Eur J Radiol. 2010;76(2):228-238. Tan TJ, Ng YL, Tan D, et al. Extrapancreatic findings of IgG4-related disease. Clin Radiol.2014;69(2):209-218. Sarles H, Sarles JC, Camatte R, et al. Observation on 205 confirmed cases of acute pancreatitis, recurring pancreatitis, and chronic pancreatitis. Gut. 1965;6(6):545-559. Kamisawa T, Funata N, Hayashi Y, et al. A new clinicopathological entity of IgG4-related autoimmune disease. J Gastroenterol. 2003;38(10):982-984. Cornell LD, Chicano SL, Deshpande V, et al. Pseudotumors due to IgG4 immune-complex tubulointerstitial nephritis associated with autoimmune pancreatocentric disease. Am J Surg Pathol. 2007;31(10):1586-1597. Takahashi N, Kawashima A, Fletcher JG, et al. 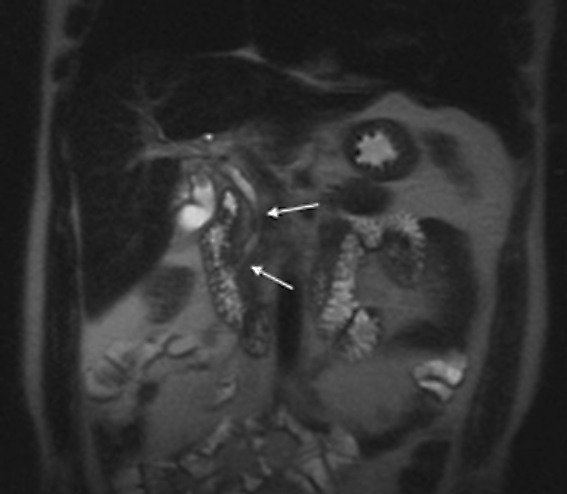 Renal involvement in patients with autoimmune pancreatitis: CT and MR imaging findings. Radiology. 2007;242(3):791-801. Triantopoulou C, Malachias G, Maniatis P, et al. 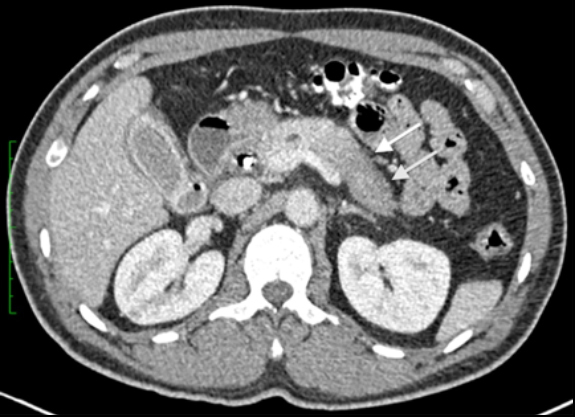 Renal lesions associated with autoimmune pancreatitis: CT findings. Acta Radiol. 2010;51(6):702-707. Shimosegawa T, Chari ST, Frulloni L, et al. International consensus diagnostic criteria for autoimmune pancreatitis: guidelines of the International Association of Pancreatology. Pancreas. 2011;40(3):352-358. Kamisawa T, Okazaki Y, Kawa S, et al. Japanese consensus guidelines for management of autoimmune pancreatitis: III. Treatment and prognosis of AIP. J Gastroenterol. 2010;45(5):471-477. 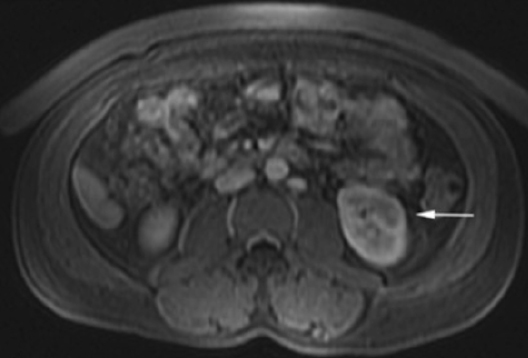 Radiological Case: Autoimmune pancreatitis with renal involvement. Appl Radiol. Prepared by Dr. Davalos and Dr. Koscheski while practicing as radiologists at Harbor-UCLA Medical Center, Torrance, CA.